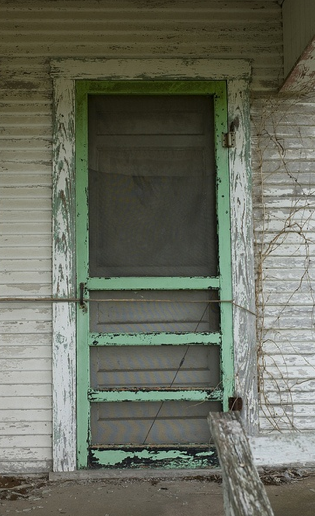 Screen doors really are the essence of Summer! Don’t you love having the windows and doors open to let the air and sounds of summer flow through through the house? those made of wood with fancy corner design? 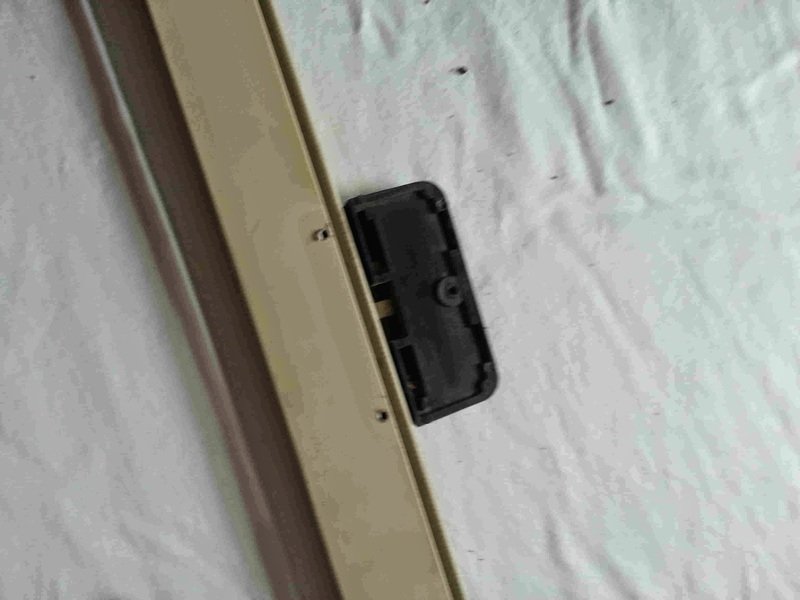 used to latch the door but rarely used anytime? And oh! How Mom would whine! “Don’t slam the door!” Mom always called. I never learned; Slam! it went every time. for which I often pine. The screen on the patio door at Sweetwater has taken a beating from MARVIN! He just loves to stretch and put his entire weight on the door! His little parlor trick caused the screen to push out and leave big gaps. Unsightly…and a great spot for bugs to enter! It was time to re-screen the door! Mr. S. and I used to take our screens to the hardware store and have them done! It doesn’t cost a whole lot…..but there are LOTS of screens at Sweetwater….and some of them are pretty big! And besides….it is a pain to take the screen out….load it into the truck….take it to the store…..wait for the job to be finished….load it back in the truck…..UGH! Then we figured out that we could DO IT OURSELVES…..it is really a simple process! A few inexpensive tools and supplies are all you need! This stuff is what holds the screen in the groove of the window. Sometimes you can use the old spline from the window you are re-screening…..but for less than $5…go wild! 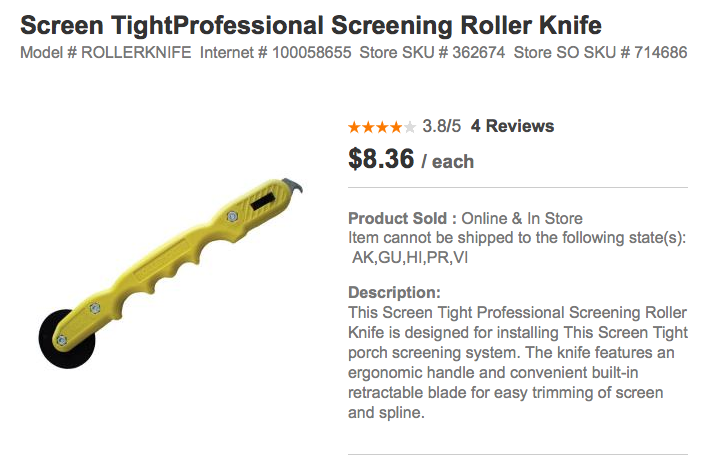 The real deal is the roller knife! Having this tool on hand means that whenever you need to re-screen….you are good to go! 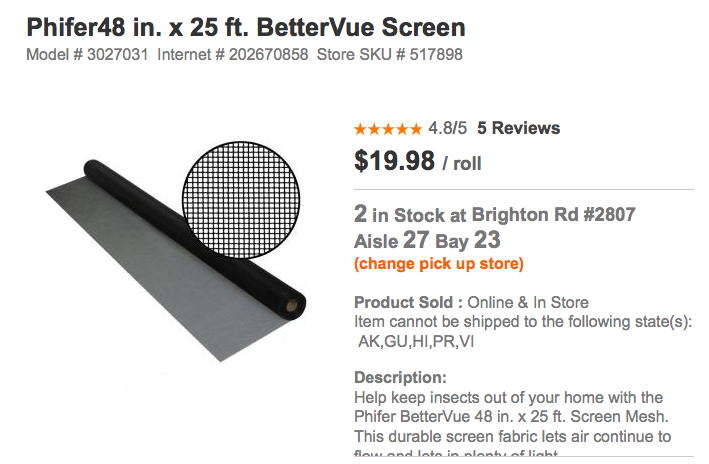 A roll of 25 ft. of screen for $20 bucks is enough to do LOTS of window….no MARVIN….don’t get any big ideas about the other windows!!! So yesterday……Mr. 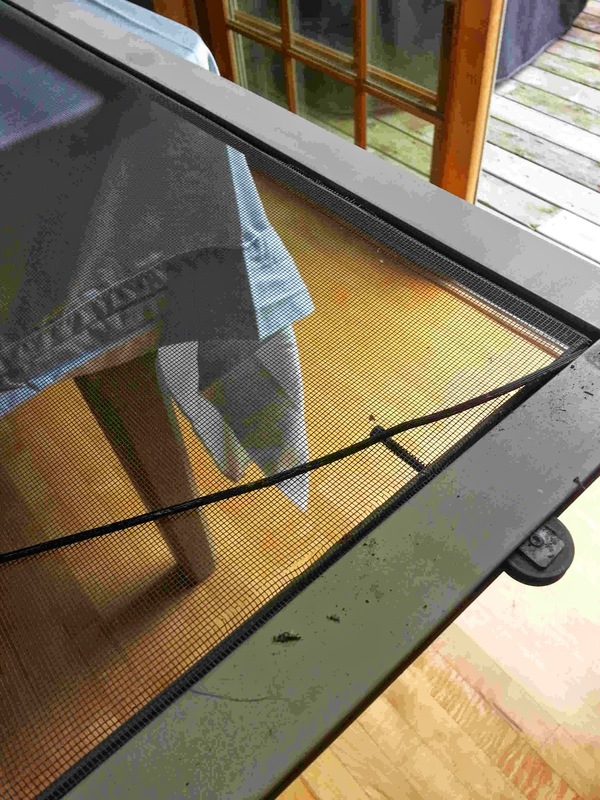 S. and I spent a quick half hour replacing the pushed out screen on the deck door! This wasn’t our first time doing this….so it goes pretty quickly! 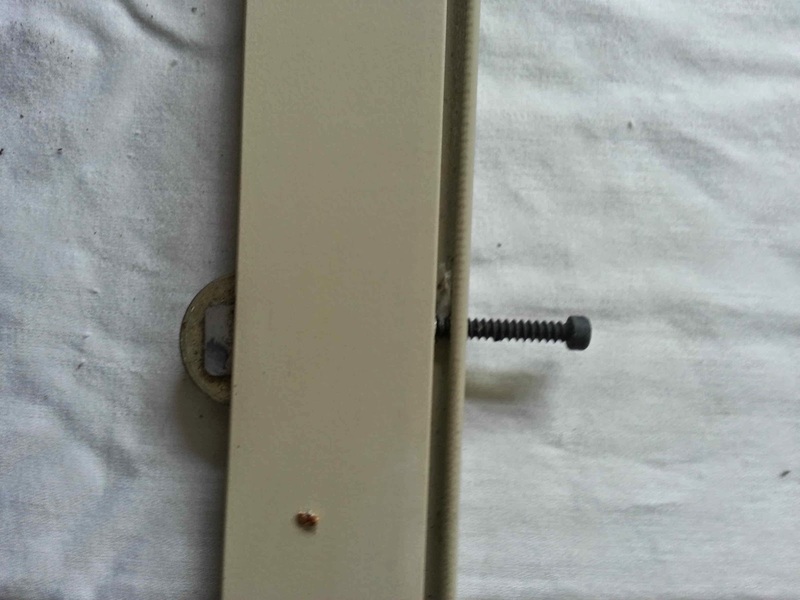 The door is easy to remove by loosening the screws that hold the wheels on the door track. 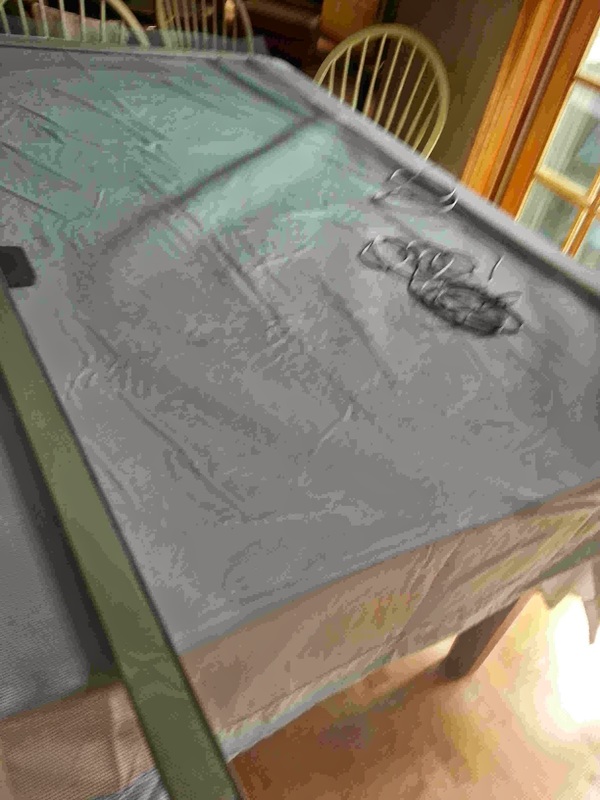 Since we didn’t want to crawl around on the floor, we covered the table with a sheet and put the screen on top. It is a simple process to pull the old spline out of the track all the way around. Then just take the old screening out. Oh…don’t forget to take the handle off…because you need to get at the track underneath it. 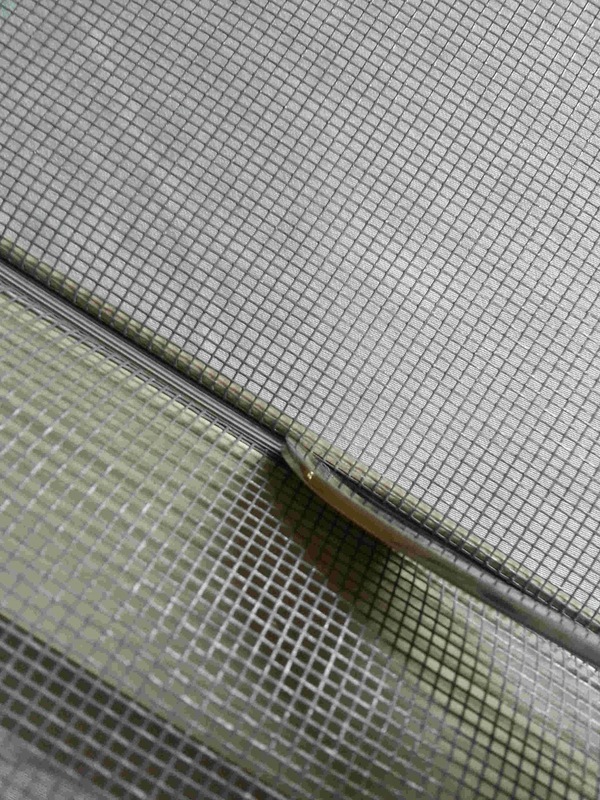 Lay the new screen material on the window and cut it…..leaving a generous amount on the ends. 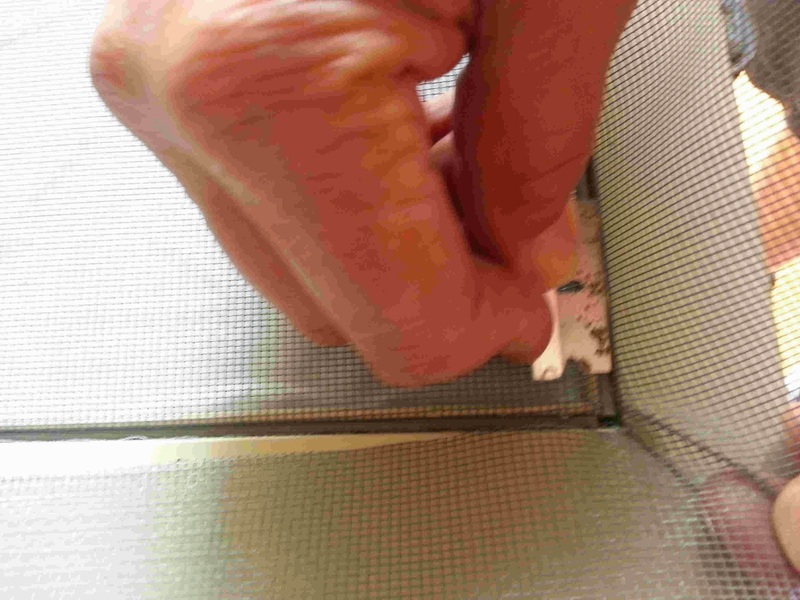 Then….start in one corner and push the spline into the track as you pull the screening tight. This is where it is nice to have a “buddy”! 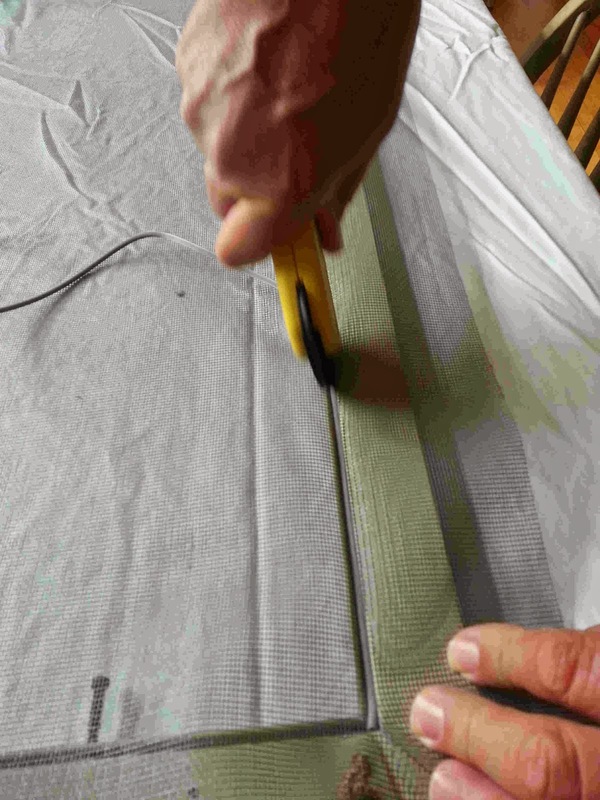 Don’t worry if you get a wrinkle….just pull the spline out and stretch tighter! After the spline is pushed in all around the screen and there a NO wrinkles…..go back with a fancy tool like a spoon handle and push the spline in even tighter. Cut the overlapping screening close to the edge with a straight edge razor blade. The trick here….DON’T cut too close or you run the risk of the screen pulling out with any pressure on it…..(think MARVIN)! Then it is just a matter of putting the handle back on…. Putting the door back in place! I timed this process…..and from start to finish…including set up and clean up….it took 38 minutes! Here is a YouTube video of the process by “an expert”….just in case I missed something! So now we wait…..to see how long before our “bad Kitty” pushes this screen out!